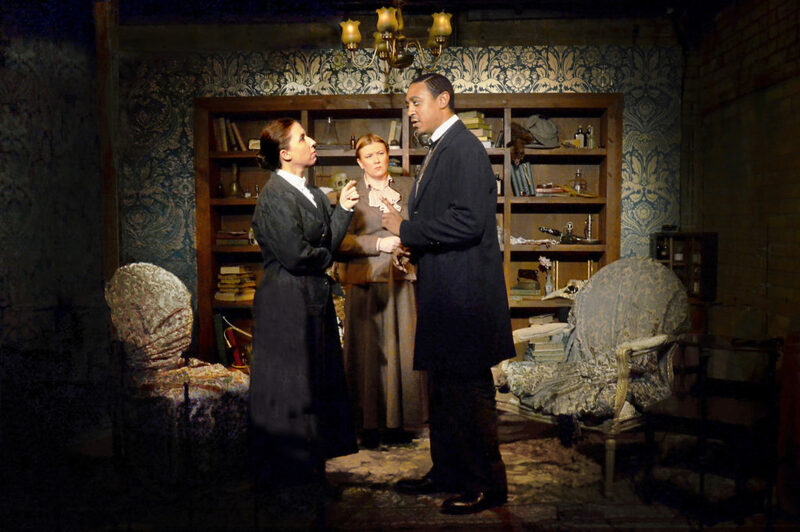 Review “Miss Holmes” (Lifeline Theatre): Encore! Series! What is next, my dear Walsh? 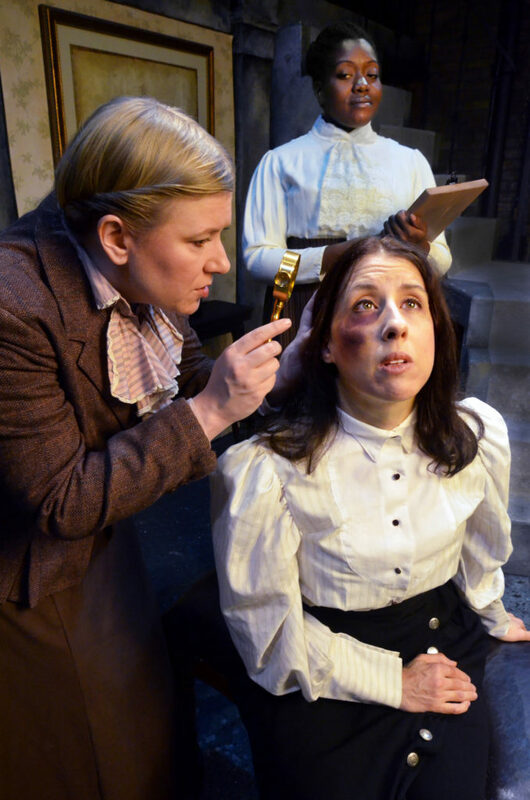 Lifeline Theatre presents the World Premiere of MISS HOLMES. The twists start immediately in this gender-bender whodunit. 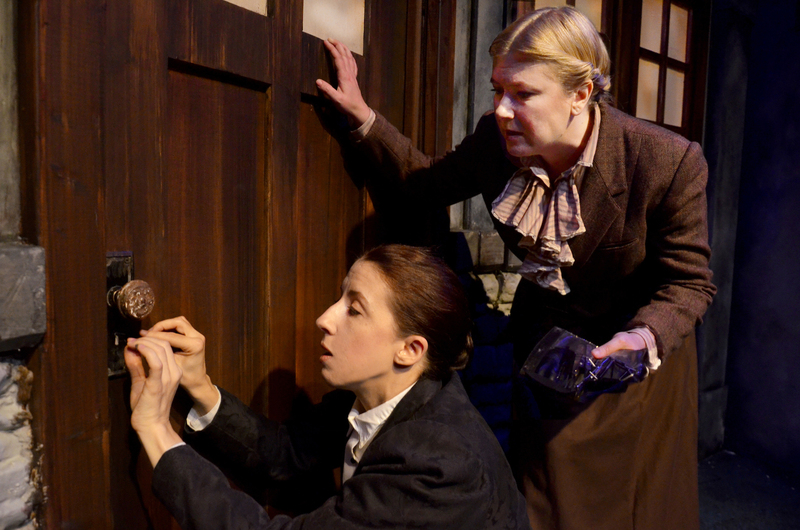 The legendary Sherlock Holmes and Dr. Watson are women. Playwright Christopher M. Walsh (no relation) pens an intriguing tale of murder. The mystery unravels as barely discernible clues are discovered by the dynamic duo. Walsh’s detective story is smart, sophisticated and droll. Even without the female slant, we would be more than satisfied with this Sherlock adventure. Yet, looking at lady sleuthing from a 19th century perspective cleverly adds layers of depth to these familiar characters. Watson struggles to be recognized as a doctor. And Sherlock’s brilliant mind lands her in the asylum… repeatedly. These women are searching for answers to the mystery and their own identities. Brilliant! The design team sets the mood for murder. Scenic Designer Ashley Ann Woods has constructed a versatile blackstone building. Curricular stairs lead up to Sherlock’s library. The shelves are stocked with books and eccentric knick-knacks like a skull and hookah. On the wall is a caricature of the detective with his infamous hat and pipe. Woods’ room serves as the mastermind’s lair. The detailed room contrasts nicely with the other stark locales. Lighting Designer Jordan Kardasz makes it effectively disappear when the action takes us away from Baker Street. Director Paul S. Holmquist casts this superbly with Katie McLean Hainsworth (Sherlock) and Mandy Walsh (Watson). They embody these personas. They are a formidable force. I’ve long been a fan of McLean Hainsworth’s perfect comedic timing. She can zing the punchline with even the slightest inflection or look. The playwright feeds her a steady diet of droll witticisms that the pint-size powerhouse delivers. At one point, through the haze of sedation, she hits on an inspector with an amusing ‘asking for a friend.’ Later at a moment of peril, McLean Hainsworth responds to the threat by bursting out in laughter. She is hysterical! The steadfast M. Walsh (no relation) balances out the idiosyncratic McLean Hainsworth. She is the even-keel sidekick. McLean Hainsworth can go further out on the limb of absurdity because M. Walsh tethers her to the tree. M.Walsh commands the situation in pistol-toting calmness. The cast is all terrific bringing the drama and comedy. Chris Hainsworth (Mycroft) plays McLean Hainsworth’s brother. From the start, we feel the tight sibling bond (which is even funnier knowing the couple is married in real life). Their no-sentiment relationship is anchored in equal parts of pride and annoyance. A smug Hainsworth plays it close to the vest. Although his actions continually surprise us, McLean Hainsworth is resigned. This mystery engages. I’m constantly trying to solve the puzzle as the characters evolve. A spunky Kate Nawrocki (Lizzie) plays a complicated damsel in distress. And Michael Reyes (Stamford) amusingly goes from insipid lovelorn sap to an uproarious German doctor. There is so much to love in MISS HOLMES that I want more! Encore! Series! When is the next installment, my dear Walsh?